Yes, you weren't reading incorrectly, I haven't flown is WAY to long a time. The new job is keeping me from flying anymore during the week, and getting a sunny weekend in Seattle is like winning the lottery. I did a short refresher flight last week, and am planning a short cross country this weekend. Stay tuned. 5/13/00 and 5/19/00 - Landing practice, and night ops. 2 flights in this journal. More back to basics training, solo work, and night operations. Read more here. Matt and I decided to work on my short and soft field landings some more today. I thing I am getting the hang of these. Read more here. 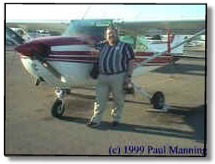 Hello, I'm Paul, and its my goal to become a private pilot. I have had this quest since I was a grade-schooler, but have never acted on that desire. The purpose of this web site is so that I may record my activities in this endeavor, as well as to have a useful place to put any links and images I find useful. This web was designed by me for my own use, but if you are reading this, and find this information useful, please drop me a note telling me so at mortman1@rocketmail.com. I will keep updating this site as to my student progress at least until I get my license. I know these diaries can be a dime a dozen, but I hope you will find mine useful....I know I will.